Saurashtra Women need to put forth their A game in the upcoming T20 league. Imagine a scenario in a cricket match when the fielding team starts getting punishment for its lackadaisical approach, thereupon the frustrated captain attempts taking control over. Seeking revenge for the damage done by the duo, skipper tries out all the possible weapon under his armoury. From a potential bowling combination of pace or spin from either ends or orthodox/unorthodox fielding setups to draw the first blood, everything tried and tested, yet the batsmen were just as fresh as at the beginning of the innings. They were relentless and in no mood to share even a minute piece of the pie. Still, the captain hoped on batsmen to commit a fault. But, they didn't. 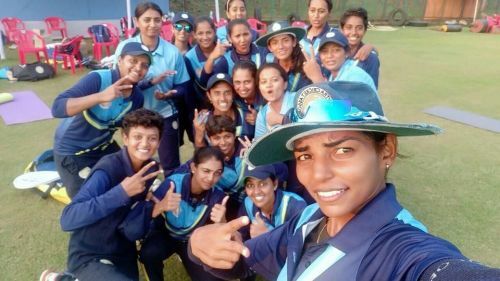 Saurashtra women's recently concluded one-day league campaign resembles some extent the 'fielding captain' in the above context. Every time they came up with a new game plan, they were simply outplayed by the opponent. Hence, they lost all their group games, and the poor performance cost them relegation from the elite group. Hardly a month has gone past to the senior women's one-day League where Saurashtra women faced a heavy drubbing in all their group games except for the one match against Haryana where rain played the spoilsport. On the verge of relegation from the elite group, the game against Haryana women was the only hope for the girls to restore the lost glory as they had already lost six games out of eight. Unfortunately, the shower crushed every hope the girls were carrying. The game declared as N/R and both the team shared the 2-2 points. However, those 2 points didn't do the world of good for Saurashtra women and the team finished winless after the eight games. A heart-breaking tour for the girls by all means. In fact, they have played better cricket in the past and defeated better opponents. Karnataka, Tamil Nadu and Punjab were taught lessons earlier, but the repetition indeed was not as the old times. Saurashtra Women team sharing a light moment after winning the game. The biggest let down for the Saurashtra team was their batting, surprisingly, which is their strong suit, never clicked as a unit the entire tournament. Like batting, bowling and fielding also had its grey areas. As a bowling unit, unlike their previous outings, the team found little difficult to adjust to the condition this time. Dhabi, Chavda and Mota contributed significantly, but the team need more from its senior players. Despite having a strong batting line up in Jayu, Mridula, Bhakti, Riddhi and Pooja, the team couldn't score over 140 runs in any game. Change in captaincy, player tussle, lack of training sessions, team selection, deterring self-confidence or playing under pressure whatsoever were the reasons for such a heavy drubbing, no team in the world will like to repeat the same mistakes over. The game of cricket is about intense spells of concentration broken up with the ebbs and flows that go between each ball that is bowled. And certainly, it doesn’t present opportunities for players to be in the zone all that often in their career. As a result, staying on the top and dominating is not easy. Considering this approach, Saurasthra women shall need to rethink or analyse thoroughly what went wrong in the last series. With the senior women's T20 League is about to kick off, Saurashtra women shall need to put the demons of the past behind and focus on their preparations for a better result. However, the dark and scary the world seems right now, a light will come, and will erase all the pain. So, in whatever the mindset the girls are now, keep the rebellious fire alive in your belly. You have a tough road to ride. Your success on the field will help cricket flourish in Saurashtra region among young girls.